OHSAS 18001:2007 - This certificate shows that we have implemented a management system which uses health and safety at work according to certain research and development, this includes road machinery, transport equipment, repair and modification of road machinery and transport equipment, research and development of military weapons and spare parts for military weapons, development, production, reconstruction and maintenance of aggregates and production of equipment in the manufacturing industry with the emphasis on engineering in free trade, development, manufacturing, refurbishing, selling and servicing industrial petitioners, robotic technology products and systems in the scope of free trade, consulting on activities, engineering and project management. ISO 14001:2015 - This certificate specifies the requirements of environmental management by enabling the organization to prepare and implement policies and objectives which take into account legal requirements and information about significant environmental aspects. The main objective of this standard is to promote environmental protection and prevent pollution in balance with socio-economic needs. Through the demonstration of successful implementation of this standard, an organization can use this to convince stakeholders that it has an adequate environmental management system. ISO 9001:2008 - specifies the requirements which may be used for internal applications within an organization, or for certification whether the for contractual purposes. 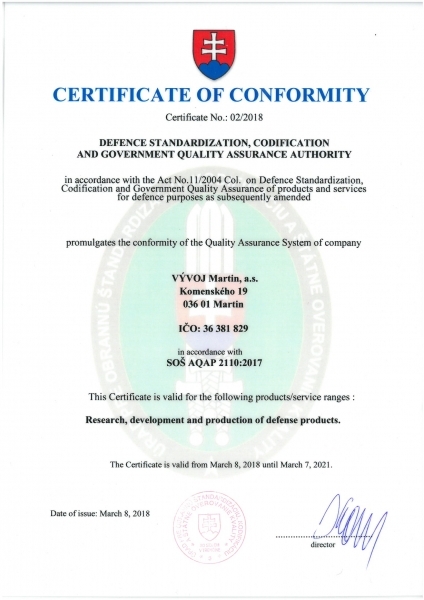 AQAP 2110 – specifies the NATO requirements for quality. SOŠ AQAP contains requirements which, if properly implemented, provide confidence in the supplier's ability to deliver product that meets the requirements, agreed in a contract with the customer. Certificate of industrial security - A degree of secrecy, "confidential" for familiarization with classified information, the transmission and the formation classified information. Permission to trade in military material - This allows the purchase / sale of military equipment, foreign trade activities with military equipment, military transport intercommunication and brokerage of war material. This comes from a decision within the Ministry of Economy. 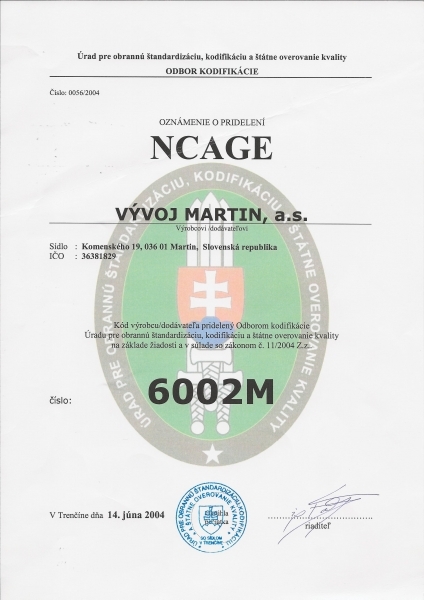 Certificate of competence to carry out research and development - authorizes VYVOJ Martin to perform research and development. The certificate is issued by the accreditation body the Ministry of Education. It is valid up to six years from the issue date. NCAGE communication award - code of the manufacturer / supplier assigned Department of the codification of the Office for Defence Standardization, Codification and Government Quality Assurance.